'SUNRAYS' and 'MOONBEAMS'...RENT ONE OR BOTH!! 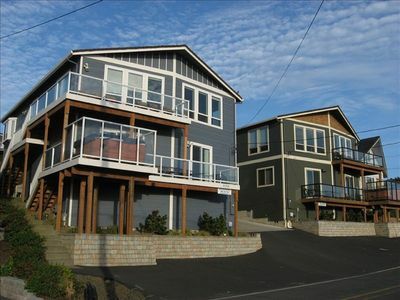 These two, luxurious, side-by-side, beach homes were custom built in 2006 with your retreat/reunion/corporate event in mind. 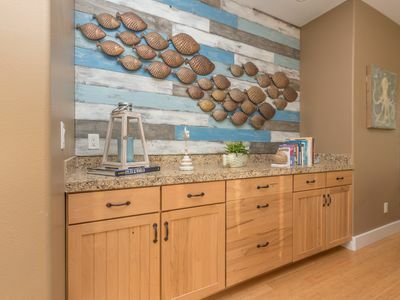 With each home at 2700 square feet, five bedrooms, three-and-one-half baths, and steps away from each other, your getaway is sure to be a perfect event. 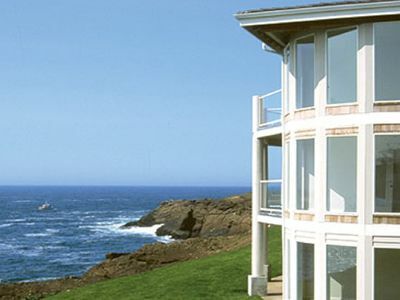 Each home features an amazing open floor plan with great room, kitchen, and dining room all together surrounded by wall-to-wall ocean view windows. This open room space makes for a great meeting area with super large table (seats 14), huge sectional couch, lounge swivel chairs, WIFI, all in the same room, and amazing views of breaking waves to mesmerize and stimulate your meeting/gathering. 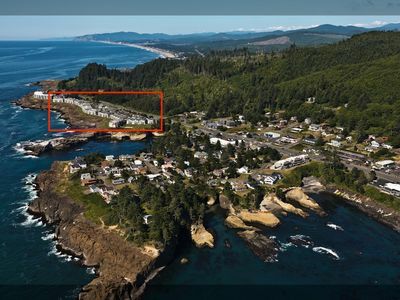 'Moonbeams' and 'Sunrays' are nearly oceanfront and share a driveway with huge parking area behind each house that can be used for parking up to ten vehicles or for a massive barbecue patio party. 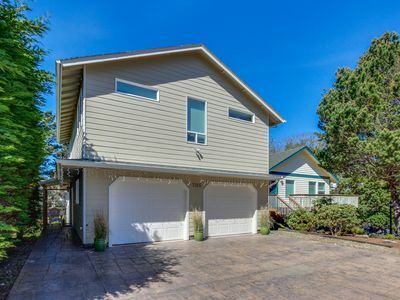 There is space for another two or three vehicles in the front of each house near the street. 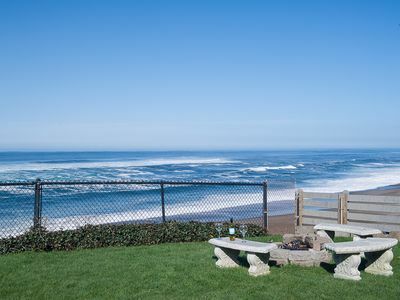 The ocean is steps away as you cross the street and walk three houses down to the 'Road's End State Park' beach access (approximately 150 feet). Super close... we are truly located in the perfect spot! 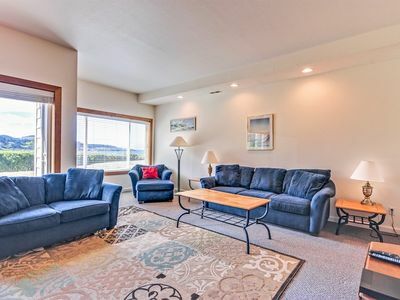 You will never be at a loss for something to do with each home offering its own recreational room with GIANT screen ROKU TV, 81-game stand-up arcade (no coin required), library, PlayStation II, GameCube, DVD/VCR, and stereo system. 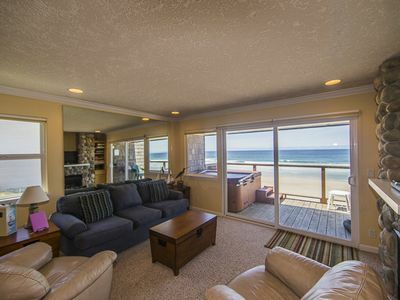 Each home features its own Ping-Pong table, extra-large stainless steel barbecue, washer/dryer, huge assortment of videos/DVDs, books, games, beach chairs, horseshoes, extra six-foot utility table with chairs, two large decks with one of the decks sporting a super-size hot tub with ocean views and wind-protected walls for seven or eight adults. When meeting and playtime is over each home features five oversized comfortable bedrooms, each with its own 27-inch TV/DVD/VCR, to retreat to. Three of these bedrooms offer king-size beds, and the two other rooms offer queen-size beds. All beds have new Simmons BeautyRest pillowtop mattresses to make your rest complete. The description below details the other very comfortable sleeping areas. 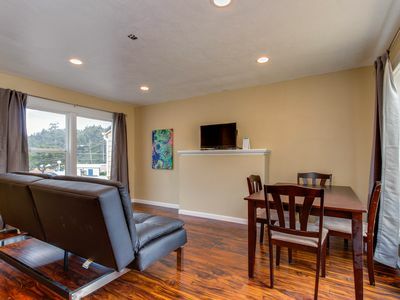 * Two upstairs bedrooms - one executive master suite with king-size bed and master bath with jetted garden tub for two, and a separate shower, master suite with a king-size bed and full-size futon. 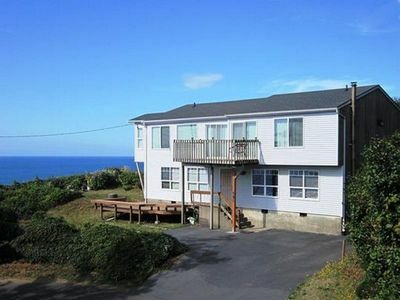 Both have wonderful bay window sitting benches with ocean views. 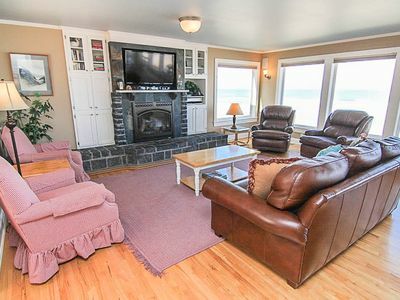 * There is another upstairs full bath with shower, fully-equipped kitchen with stainless steel appliances and granite countertops (with a bar that seats three), adjoining dining with HUGE table for seating up to 14, and adjoining great room with a gas fireplace, TV/DVD/VCR, stereo, built-in library with sitting area and full oceanfront wall-to-wall windows. 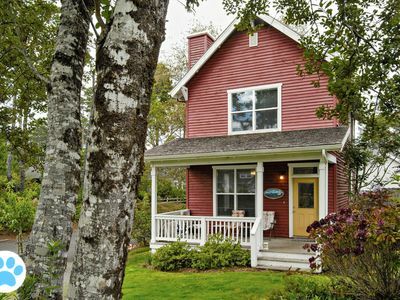 * Downstairs has three bedrooms; two bedrooms have a queen-size bed and a bunk bed. The bunk has a lower full-size futon for extra sleeping space. One of these bedrooms also has a sliding door for private access to the hot tub. The third bedroom has a king-size bed. 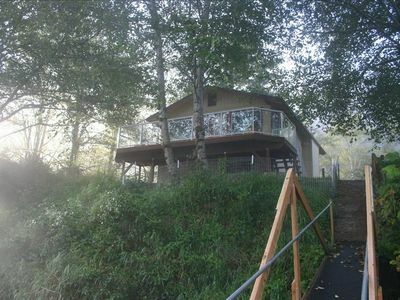 There are two bathrooms downstairs, one full bath (with tub/shower) and one half bath off of the recreation room. All beds have Simmons BeautyRest pillowtop mattresses (even the twin bunks!). 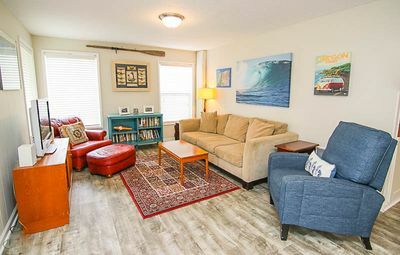 * The family recreation room has an alcove built-in library with a queen-size sofa sleeper, and adjoining large open room with couch and love seat, large TV/DVD/Blue-Ray, GameCube, and PlayStation II. This room also has an awesome, no coin required, 81-game arcade machine. 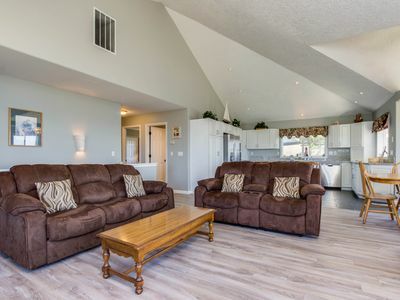 Family recreation room can sleep two (again, we suggest the kids) and has slider door access to deck with hot tub. Not valid during Holidays/Holiday weeks. 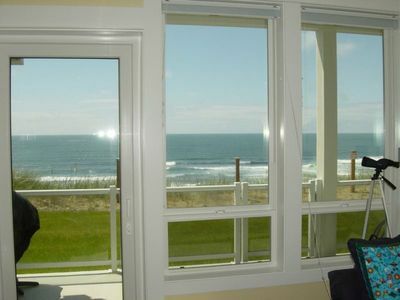 Modern condo w/peek-a-boo ocean views, nearby beach access - dogs ok! 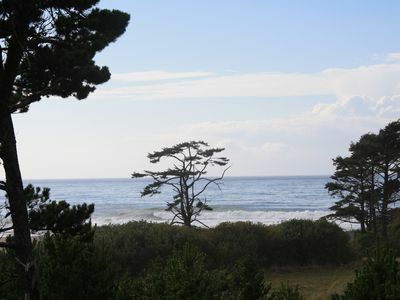 Ocean View - Easy Beach Access - Quiet Nestled in Trees - Bird Paradise! *Promo! 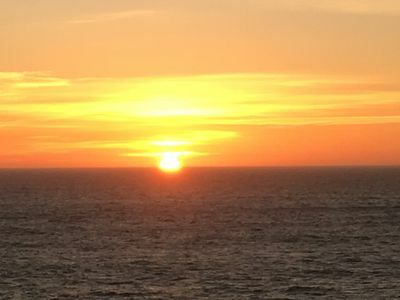 * Beautiful Oceanfront Corner Condo-Private Hot Tub, Free Wifi, Pool! 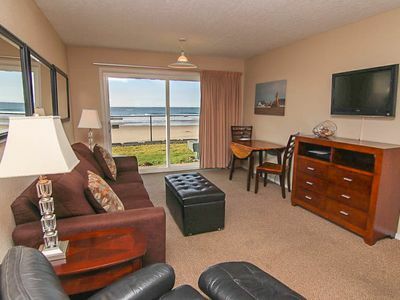 Depoe Bay Oceanfront Condo with Front Row Seats to Whale Watching! 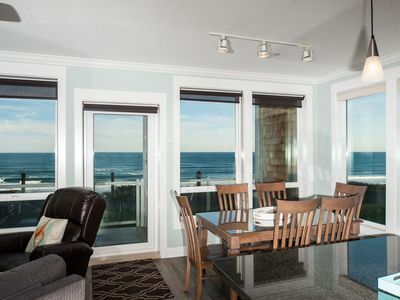 Oceanfront Condo with Indoor Pool & Sauna! 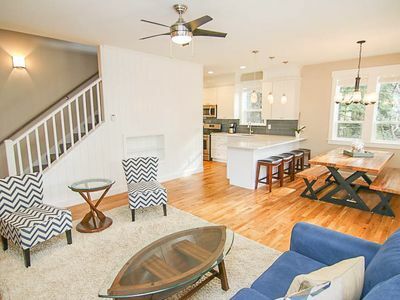 Retro-Surf Family Fun With Spacious Yard, Hot Tub, and Allows Pets!